Cloud 9 supplies a kite, helmet and harness to all students that need one. The shop carries a massive line of rental and retail gear for student use and purchase — Ozone, Cabrinha, Naish, North, Best, Crazy Fly, HQ, Liquid Force and beyond. For kite-buggy learners, we provide the buggy. Students must supply their own skis or snowboard, and wear weather- and sport-appropriate clothing to the lesson. Students learn much faster on skis than snowboards; if you do both, start with skis! It’s a good idea to bring snacks and water, too. 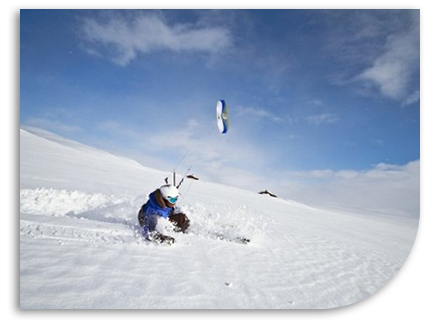 Cloud 9 covers snow- and buggy-kiting skills from top to bottom in each class. You may expect to learn kite safety, the wind window, emergency procedures, up-wind riding and more in your first lesson. For advanced lessons, we cover jumping and stunts. Cloud 9 holds lessons at a variety of sites around beautiful Park City, UT. Lessons are also held at other sites within an hour and a half drive from SLC if weather conditions are more favorable. Kiting, of course, is possible wherever ample space, wind — and, if appropriate, snow coverage — coincide. Generally, new students can figure out the basics of snow kiting in 1-2 lessons — enough to be safe and have fun. Each half-day lesson lasts approximately 3 hours. Lessons cost $350.00 if Cloud 9 provides all gear, or $300.00 if you supply your own.